Six predynastic artifacts from ancient Egypt. In archaeology, an artifact or artefact is any object made or modified by a human culture, individual or group. Often the artifact—or object—is recovered long after the time it served its purpose, through an archaeological endeavor or even by accident or chance. Examples of artifacts from various time periods would include stone tools such as projectile points, pottery vessels, metal objects such as buttons or guns, and items of personal adornment such as jewelry and clothing. Other examples include bone that show signs of human modification, fire cracked rocks from a hearth, or plant material used for food. Interestingly, one of the most common artifacts found is garbage. In addition to giving archaeologists important information about previous cultures and civilizations, artifacts aid in dating earth's time periods and in historical record keeping. If a picture is "worth a thousand words" as the expression goes, then artifacts tell even more. Their beauty, rarity, and history unlock the secrets of their ancient owners. 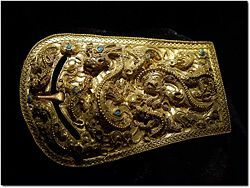 Gold belt buckle excavated in Pyongyang, North Korea during the Proto-Three Kingdoms period. In archaeology it is not only the physical location of a discovery that holds significance, but the context (or setting) as well. And an archaeological context does not only refer to a geographical place, it can also be an event in time which has been preserved in the archaeological record. Multiple fills of soil in a ditch, for example, could imply multiple contexts. By separating a site into basic, discrete units, archaeologists are able to create a chronology for activity on a site and not only describe it, but allow for its interpretation as well. Most grave goods recovered by archaeologists consist of inorganic objects such as pottery, stone, and metal tools, but there is evidence that already decayed organic objects were also placed in ancient tombs. Some of the most famous and well preserved grave goods are those from ancient Egypt. Ancient Egyptians believed that goods buried in tombs could be used by the deceased in the afterlife. Middens, dumps which contain human waste, can also contain a variety of archaeological material, including animal bone, feces, shell, botanical material, vermin, sherds, lithics, and other ecofacts associated with past human habitation. Middens are useful resources for archaeologists who wish to study the diet and habits of past societies. Middens with damp, anaerobic conditions can even preserve organic remains which can be analyzed to obtain information regarding climate and seasonal use. In archaeology, a hoard is a collection of artifacts purposely buried in the ground, usually with intention to recover them at a later date. Hoarders oftentimes died before retrieving their loot, and these surviving artifacts can sometimes be uncovered at a later time by hobbyists with metal-detectors or by archaeologists. Hoards provide a useful method of determining the dates of artifacts. They can also, sometimes, indicate the degree of conflict or war in an ancient society. For example, circumstances in fifth and sixth century Britain spurred the burial of several famous hoards whose remains can be seen today at the British Museum in London. A votive deposit or votive offering is an object left in a sacred place for ritual purposes. A contemporary example would be that of the Roman Catholic Church where offerings are made either to fulfill a vow, or are objects given to the Church in gratitude for some favor that was granted. Today, votives can be lit candles, or offered flowers, statues, vestments, or donations such as those deposited into a fountain or altar. 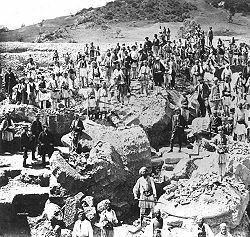 The 1875-1881 German excavation of Olympia, Greece. Artifacts are often called finds when handled during archaeological excavation. Artifacts are related to the archaeological record by their position defined by the Archaeological context they are discovered in. This is important for Seriation and relative dating analysis, and is closely related to work post excavation with the use of a Harris matrix that is created during the excavation process. The Harris Matrix is a tool developed by British archaeologist Edward Cecil Harris in 1973 to assist in the examination and interpretation of the stratigraphy of archaeological sites. An analysis of archaeological finds are often made during excavation for the purpose of spot dating. Spot dating tends to rely on pottery typology. This pottery dating analysis was pioneered by 19th century archaeologists such as Georg Loeschcke. Apart from dating and supporting the process of excavation, artifacts lend themselves to a host of post excavation disciplines. Post excavation analysis is normally the most time-consuming part of an archaeological investigation. It is not uncommon for the final excavation reports on major sites to take years to be published. The processing and interpretation of those material remains, in conjunction with the artifacts themselves, is the essential final step in completing the picture of past human activities occurring in an area over time. Artifacts, ecofacts, and features say little themselves, but researchers can make meaningful inferences about these when they are studied closely and in detail. Analysis is the examination, description, classification, and identification of that material, as well as consideration of its broader meaning. Artifacts should be distinguished from the main body of archaeological stratigraphic features, (those nonportable remains of human activity, such as hearths, roads, or remains) and from artifacts that are biofacts or ecofacts. Biofacts or ecofacts are objects of archaeological interest created by organisms other than humans, such as those from seeds or animal bones. Natural objects which have been moved but not changed by humans are called manuports. Examples would include seashells moved inland or rounded pebbles placed away from the tidal action that would have fashioned them. These distinctions are often blurred; for instance, a bone removed from an animal carcass is a biofact, but a bone carved into a useful implement is an artifact. Similarly there can be debate over early stone objects and whether they are crude artifacts made by humans or are instead naturally occurring phenomena that only appear to have been used by humans. The degree to which an artifact represents the social grouping from which it came is a subject over which archaeological theoreticians disagree. Focusing on the artifact alone can produce enlightening information about the object itself, but such close scrutiny can ignore other mitigating factors which may shed further light on the society being studied. Traditional museums are often criticized for being too "artifact-led," that is for displaying items without any contextual information about their purpose or the people who made them. Although most people think of collections as objects from the same geographical area, museums often identify collections by the donor’s name. Collections can be created by private individuals, early archaeologists, or by professional archaeologists. Often, collections will focus on a specific region of the world and some are held in storage for research purposes only. Not all collections are owned by the museum that houses them. The Burke Museum of Natural History and Culture in Washington, for example, curates collections for government agencies (federal to city) and Native American Tribes. Since the collections are owned by another party, but managed by the Burke Museum, they are referred to as held-in-trust collections. Though some collections have access restrictions, most are managed to allow full research access to interested parties. Examples of interesting artifacts abound and can be seen at museums such as the American Museum of Natural History in New York or the Smithsonian Museum in Washington D.C.. The Smithsonian, in particular, is home to the oldest collection of artifacts from the age of flight, including the Wright brothers 1903 Flyer and the landing module from the 1969 Apollo 11 flight to the moon. One of the most highly attended touring exhibits in the United States in 2007 and 2008, was the artifact collection of the ancient Egyptian pharaoh King Tutankhamen (King "Tut"). The collection Royal Burial Treasures, discovered in 1922, contains priceless objects from the Golden Age of Pharaohs. The Burke Musem in Seattle, Washington, displays many Pacific Northwest Indian artifacts. Some of the museum's research-related focus is on the arctic habitats of polar bears and migratory birds. Artifacts and their related documents, photographs, and maps, require cataloging, preservation, and analysis. Curation involves storing artifacts and archives using conservation-quality products, cataloging them in a computerized database and monitoring the artifacts and storage environment over time. This ongoing preservation of the past for the future is often done by volunteers and supported through generous archaeological endowments. Artifacts are the legacy of all human cultures and all of the natural world since the beginning of time. Artifacts carry important messages across time about the inhabitants of the earth and reveal important information about origins and development. ↑ The Burke Museum of Natural History and Culture, About the collections. Retrieved June 19, 2008. ↑ King Tut Exhibition, Tutankhamun and the Golden Age of the Pharaohs. Retrieved June 18, 2008. ↑ Burke Museum, Exhibits. Retrieved June 18, 2008. ↑ Find Articles, Indian artifacts; identification and value guide. Retrieved June 18, 2008. ↑ Anceint Resource, Holy Land Biblical-Period Artifacts. Retrieved June 18, 2008. ↑ Harvey Rachlin, Lucy's Bones, Sacred Stones, & Einstein's Brain: The Remarkable Stories Behind the Great Objects and Artifacts of History, from Antiquity to the Modern Era (New York: H. Holt). Ewen, Charles Robin. 2003. Artifacts. Archaeologist's Toolkit. Walnut Creek, CA: AltaMira Press. ISBN 075910400X. Kipfer, Barbara Ann. 2007. Dictionary of Artifacts. Malden, MA: Blackwell Publishing. ISBN 1405118873. Margolis, Eric, and Stephen Laurence. 2007. 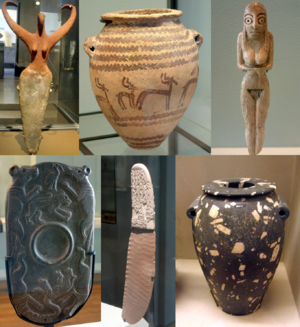 Creations of the Mind: Theories of Artifacts and Their Representation. Oxford: Oxford University Press. ISBN 9780199250981. Mills, Elizabeth Shown. 2007. Evidence Explained: Citing History Sources from Artifacts to Cyberspace. Baltimore: Genealogical Pub. Co. ISBN 9780806317816. Rachlin, Harvey. 1996. Lucy's Bones, Sacred Stones, & Einstein's Brain: The Remarkable Stories Behind the Great Objects and Artifacts of History, from Antiquity to the Modern Era. New York: H. Holt. ISBN 0805039643. Military Artifacts of Spanish Florida Artifacts.org. Museums Displaying Lycian Artifacts Lycianturkey.com. The Mystery and Miracle of God's Artifacts Biblearchaeology.org. Solomon's Temple Artifacts Found by Muslim Workers News.nationalgeographic.com. This page was last modified on 18 April 2016, at 14:38.